The JPY and the USD lost against the most of its major counterparts. The AUD has continued its upward trend and the government of Australia will increase the interest rates. However, we wish you a successful trading day. The EUR climbed for a second day versus the USD and the JPY on renewed optimism that the global economy is recovering from the finance crises. That increases the demand for investors to buy higher yielding assets. The EUR reached 133.65 against the JPY. Furthermore, the EUR climbed versus the USD to 1.4794. The JPY weakened against 15 of its 16 major counterparts before a U.S. report forecasts that factory orders will rebound in September. That may reduce the demand for the relative safety of the JPY. The USD gained against the JPY and reached 90.33. Also the USD weakened against the most of its 16 major counterparts, as it lost against 13 of them. Responsible for that are speculations that the Fed will keep the interest rates near zero for a longer period. The reasons therefore are that the banking system in the U.S. is still far from a recovering and isn`t robust enough. The AUD continued its bullish trend for a second day before the central bank announces to increase the interest rates from 3.25% to 3.5% today. 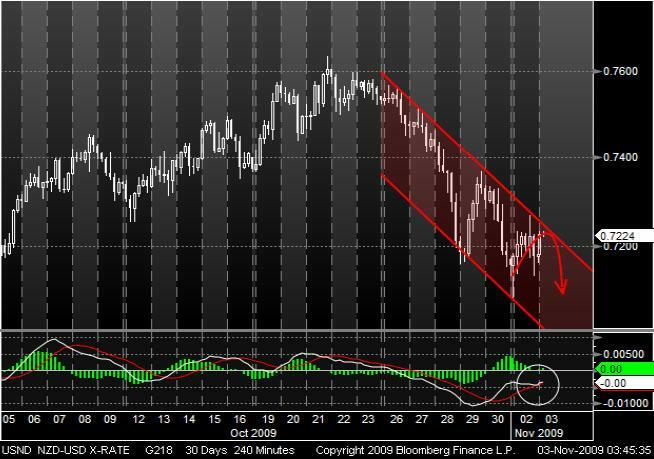 Since the beginning of September, the EUR has been trading in a bearish trend channel against the NZD. Recently, the currency pair moved upward and crossed the upper line from the trend channel. 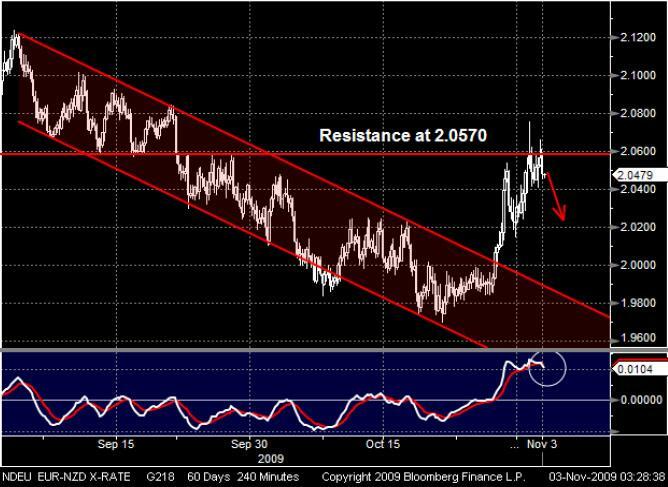 The EUR even reached its resistance at 2.0570 but it seems that the resistance is probably strong enough to stop the bullish trend. Furthermore a changing trend maybe indicated by a crossing MACD through the signal line from the top. By the end of October, the NZD has been trading in a bearish trend channel against the USD. At the moment, the currency pair trades near to the upper line from the trend channel. When the NZD touched the upper line, the prices always rebounded. Also the MA Oscillator could support with a breakthrough of the signal line a continuing bearish trend channel.